Adding a sensational heat to any dish, chilli is widely used in many cuisines. Most notably Mexican, Indian and Thai cooking. Whether you like the heat or would rather leave it out it can add another dimension to curries stir fries and even chocolate cakes. Chilli originated in the Americas and is widely believed to have been brought to the rest of the world by Columbus however, India is now the largest producer of chilli in the world. 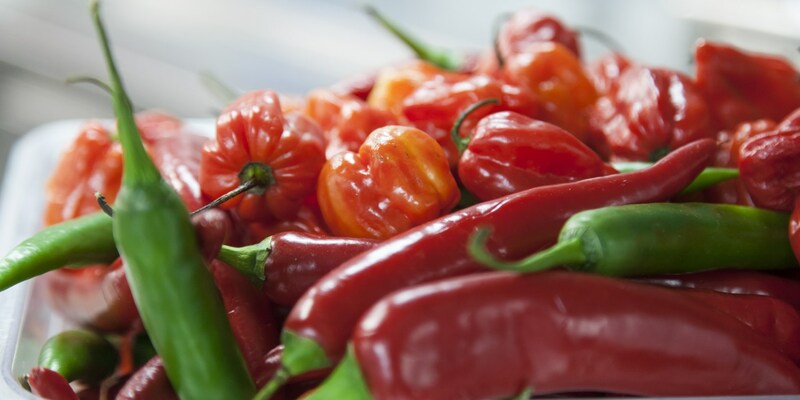 There are over 200 known varieties of chilli, the smaller generally being regarded as the hottest. The chemical which gives chilli its heat is called Capsaicin, this is measured in chilli in Scoville Heat Units or SHU. Pure Capsaicin measures at 16 million SHU versus the generic bell pepper measuring 0. Everything else is found somewhere in between, Jalapenos ensuring up to 8000 and habanero chilli up to 350000. Cooking chilli doesn’t actually remove any of the heat so the best way to prevent your mouth from burning is to remove the seeds as these are the hottest part of the chilli. Remember to wash your hands after handling chillies and be careful not to rub your eyes as this could result in a nasty shock! When adding chilli to a dish it is a matter of personal preference, depending on how hot you like your food. It can be added to oils for salad dressings and preserves such as Richard Davies Chilli Jam, perfect with tempura prawns. Chilli is used in a variety of Asian dishes. Try Alfred Prasad’s Chicken curry, or Marcello Tully’s Thai fishcakes with sweet chilli dip. Don’t rule chilli out of desserts either, it can give them a fantastic kick have a look at Robert Thompson’s Chocolate and chilli tart with crème fraiche and lime or Anna Hansen’s refreshing Mango and chilli sorbet.